The Friday Evening Satellite Picture showing high cloud cover moving through the Findlay and Hancock County Area. Temperatures are very pleasant this evening. Those are mainly in the lower to middle 70s. 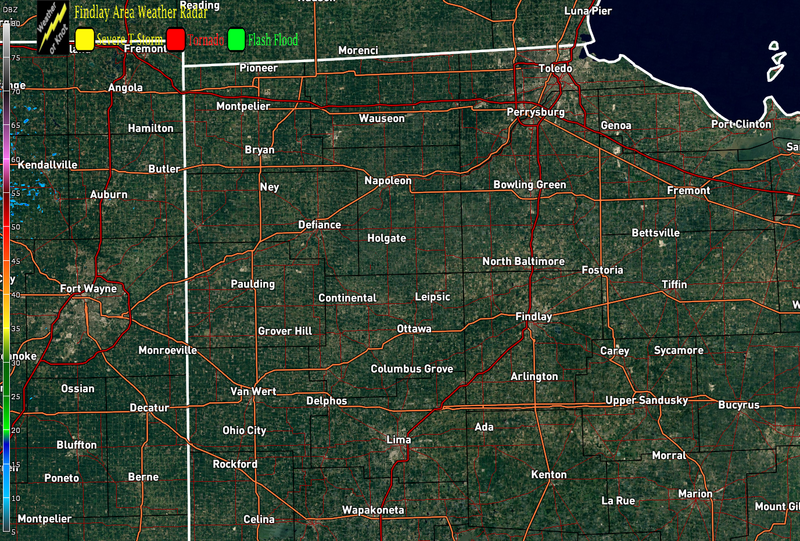 Evening weather radar shows a clear scan across the local area. The remainder of this Friday Night will feature partly to mostly cloudy skies. Temperatures are forecast to be mild. Overnight low temperatures are forecast to drop back into the middle and upper 50s. WEEKEND WEATHER: The Fall like weather the local area has been able to enjoy for much of this work week will be long gone by the start of the day on Saturday. A southerly component to the wind will be noted. That will allow two things to happen. One will be temperatures warming into the middle 80s for highs Saturday and Sunday. Second is the humidity levels will be on the increase. Chances for showers and thunderstorms are in the forecast for the entire weekend. Low temperatures Saturday and Sunday Night are forecast to drop back only into the middle and upper 60s. LOOK AT NEXT WEEK: Summer time weather will continue through the balance of next week. Conditions will be warm and humid. Most of next week will feature daily chances for scattered afternoon and evening showers and thunderstorms. By the middle of next week, the potential is there for the high temperatures to climb to near 90 degrees, especially Tuesday and Wednesday. Look for the next Findlay and Hancock County Forecast Discussion either Saturday Afternoon or Evening. Enjoy the rest of your evening!